Amanda has been teaching elementary school for 12 years. During those years, Amanda had the privilege of working with Mitch at Hampton Day School in Bridgehampton, NY. She was a member of his math team and attended numerous workshops given by him throughout the years. Amanda found that Mitch’s philosophy about teaching mathematics fit well with her own teaching philosophies and soon became aware of the effectiveness of his method of looking at each and every concept and procedure anew. Throughout her teaching career she has built upon her skills in understanding and addressing children’s individual learning styles and developed and tailored curricula accordingly. Like Mitch, she has worked toward integrating subjects to make the thinking and learning process more interesting and visible. Her students and colleagues routinely comment that she is just as excited about learning as the students are. Amanda received her Masters in Special Education from Bank Street College of Education in NYC in 1996 and her Bachelors in Science in Marketing from SUNY’s Fashion Institute of Technology in NYC in 1992. Other than teaching, Amanda, like all other Adler-n-subtract.com faculty, has used her problem solving ability to protect the natural habitat for future generations. She has been actively involved, through volunteer work, with Long Island marine mammals since 1988 and currently is the treasurer of the Coastal Research and Education Society of Long Island (www.cresli.org). 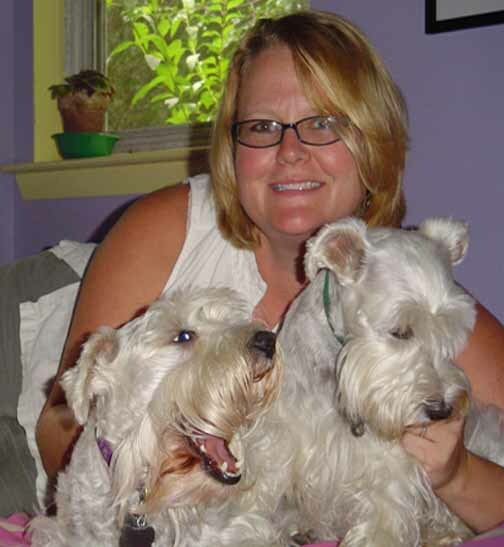 When there is time left in the day, Amanda enjoys quilting, playing with her dogs, and cooking. She also makes organic dog treats that are sold in local stores: Good Dog Good Barkery (https://www.google.com/base/a/good.dog.goodie). Combining his passion for preserving the environment with his talent in mathematics and it's language of patterns, Dr. Arthur H Kopelman is a Full Professor of Science at the Fashion Institute of Technology of the State University of NY, and an Adjunct Associate Professor of Earth and Marine Sciences at Dowling College. Dr. Kopelman applies mathematics in his role as a population ecologist specializing in the population dynamics and feeding and behavioral ecology of fin whales (Balaenoptera physalus) and humpback whales (Megaptera novaeagnliae) in the waters of NY and New England. He received his PhD in 1982 from The Graduate School and University Center, CUNY, and has been a faculty member of FIT since 1981. As an educator, Dr. Kopelman is one of the co-founders, President, and web master of the Coastal Research and Education Society of Long Island (http://www.cresli.org), a non-profit research and education organization whose mission is: To promote and foster understanding and stewardship of coastal ecosystems through research and education. Kimberly Colman (A.K.A. “Kim”), one of the youngest of the Adler-n-subtract.com members, has the admirable and unexpected distinction of having had at least as much experience -- both qualitatively and quantitatively – as some of her A-n-S colleagues twice her age. A product of a large and complex family, Ms. Colman’s mother is a first generation immigrant from Cambodia while Kim’s father is a third generation Irish American. The oldest of four girls, she is idolized for her creative, nonconforming, sometimes flamboyant personal style, and this has, at her young age, already enabled her to demonstrate (and develop) talents in a range of fields from dance, manager of a United Parcel Service store, and model. She has also been a family translator/interpreter -- all while supporting herself and contributing to her family’s living expenses. Having spent the majority of her life in Massachusetts, where she divided her time between various academic pursuits, at which she excelled without exception while becoming one of the community’s most sought-after soccer players, she moved with her family to the Sarasota area of Florida, where she continued pursuing her academic and athletic passions. Within a few weeks she was mastering her new territory and settling in to her relocated life when fate intervened to challenge her newfound daily rhythm by guiding her to cross paths with the then new website of Adler-n-subtract.com. Kim has already contributed hundreds of hours to the website while meeting the increasing demands made of her time and brainpower to progress through her early college years. She also continued to help Adler-n-subtract develop its products, and then, later, assist in selecting and sorting incoming questions using her impressive and growing aptitude and efficiency so that she could not only help us produce what visitors to the site encounter on their screen, but find ways to do so from remote locations that would enable her to continue to sharpen her focus on athletics, schooling, and devotion to family. Mathematically, Mitch describes her as a “problem-solving wizard” and always adds his admiration for her ability to demonstrate a consistent and clear sense of integrity. Since she has remained with the website from its early days through its current growth, Mitch states that he has exciting plans and opportunities lined up for her and is prepared to help Kim see the benefits of remaining aboard regardless of how far she travels both geographically in other directions in her personal life. After all,” Mitch adds proudly, “she gives an entirely enriched meaning to the term ‘multi-tasker’ and will do whatever it takes to help Kim appreciate the virtues of continuing to be a member of the Adler-n-subtrract.com team! The first time Elan Nguyen was introduced to numbers, she fell in love with them. She won her first math competition, "Math Superstars", in fifth grade and went on to become the first "mathlete" to pull off a three-peat in the Sarasota-Manatee-Venice junior high MathCounts Competition. Today she continues to enjoy and place high in high school regional and state math competitions as a member of Mu Alpha Theta. When not fueling her passion for math, Elan enjoys cracking word jumbles and Sudoku puzzles, playing the piano, and catching an occasional hour of reality television. Her other passions include cooking, playing basketball, and reading -- ranging from Harry Potter to the New York Times, focusing equally on world events and the comics. 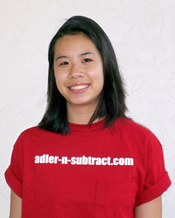 Most recently, she stumbled upon Adler-n-Subtract.com, and soon proposed that she become its first "Summer Intern". "And the rest," Mitch Adler states, smiling, "will be history."